* For fabulous sparkle, we present Mariell's top-selling 5-row AB rhinestone stretch bracelet measuring 3/4" w and plated in silver rhodium. 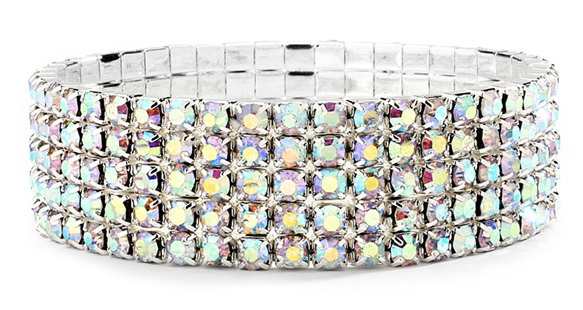 * This wholesale AB rhinestone bracelet will match with any bridal, prom or special occasion dress with its iridescent rainbow pastel shimmer! * Add this Aurora Borealis Bracelet to your store's jewelry showcase and get ready for the reorders! * We guarantee this one size fits all bracelet will be an instant best-seller.